In 2017, the Metropolitan Transportation Commission and the Association of Bay Area Governments convened the Committee to House the Bay Area, known as CASA, a think tank of major employers, developers, labor interests, social equity and housing advocates, and government officials from major cities to find a solution to the Bay Area housing crisis. Out of those brainstorming sessions came the 2019 CASA Compact, a 10-point plan which provides a framework for expanded state legislation, including tenant protections, housing approval processes and transit zoning. The Compact provisions would be partially funded over 15 years with $1.5 billion annually in new local and regional revenue, with the goal to place the revenue measures on the ballot in 2020, as presented by two MTC representatives at the Tri-Cities gathering. 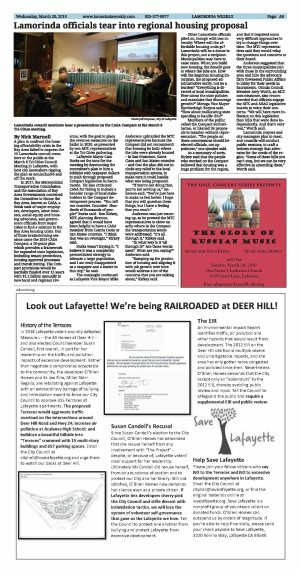 Lafayette Mayor Cam Burks set the tone for the meeting by denouncing the committee's plan to hire a lobbyist with taxpayer dollars to push through proposed Compact legislation in Sacramento. He also criticized CASA for failing to include a broader range of local stakeholders in the Compact development process. "You left out counties. Counties! Hundreds of thousands of people!" Burks said. Ken Kirkey, MTC planning director, agreed that it would have been helpful to have a CASA member from Contra Costa or San Mateo counties. "I think that was an oversight," Kirkey said. Burks wasn't buying it. "I believe it was a completely premeditated strategy to alienate a large population, and I am truly disappointed as a taxpayer and a leader in this city," he said. The onslaught continued as Lafayette Vice Mayor Mike Anderson upbraided the MTC representatives because the Compact did not recommend that housing be built where the jobs were already located - in San Francisco, Santa Clara and San Mateo counties - and that the plan did not include any relief to the local transportation system, to make sure it could handle what was being proposed. "If you're not doing that, you're not serving us," Anderson said. "You're just here to make us feel better. I hope that you will question these things, but I have a feeling that you won't." Anderson was just warming up, as he pressed the MTC representatives to show exactly where in the Compact the transportation issues were addressed. "It's all through it," Kirkey said. "In what way is it `all through it?' Are those words used? What are you saying?" Anderson said. "Ramping up the production of housing and aligning it with job growth over time would address a lot of the concerns that you are talking about," Kirkey said. Other Lamorinda officials piled on, though with less intensity: Where will the affordable housing units go? Lamorinda will be a donor to this project, not a recipient. Municipalities may have to raise taxes. When you build new housing, the benefit goes to where the jobs are. How will the Regional Housing Enterprise, the proposed administrative entity, not be a burden? "Everything is directed at local municipalities. How about the state policies and mandates that discourage growth?" Moraga Vice Mayor Kymberleigh Korpus said. "How about reallocating state spending to handle this?" Members of the public called the Compact authoritarian, or likened its proposals to taxation without representation. "The people on these commissions should be elected officials, not appointees," one speaker said. As a summary of sorts, Kirkey said that the people who worked on the Compact believed that housing was a huge problem for the region, and that it required some very difficult approaches to try to change things over time. The MTC representatives said they would relay the questions and concerns to their board. Anderson suggested that the three municipalities join with those in the surrounding area and hire the advocacy firm Townsend Public Affairs to lobby for their needs in Sacramento. 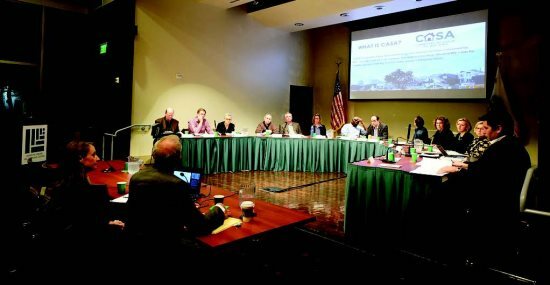 Orinda Council Member Amy Worth, an MTC commissioner, also recommended that officials engage the MTC and ABAG legislative boards to voice their concerns. "We will have more influence on this legislation than bills that were done independently. And that's very real," Worth said. Lamorinda mayors and city managers plan to meet, and councils will conduct public sessions, to craft a written strategy that advocates for the needs of the region. "Some of these bills you can't stop, but we can be very effective in amending them," Worth said.